Dublin.International.Comic.Expo or D.I.C.E came to Ireland on September 28th and 29th last weekend and it was a sight to behold. 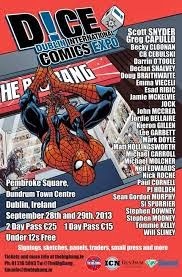 This was a stripped down old school comic con with an emphasis on two things, comics and Irish talent. This being my first D.I.C.E I didn't know what kind of convention I was going to,so I asked the owners of Big Bang Comics in Dundrum town centre. They explained to me that it was a no frills comic convention, no television promotions, no film trailers, just creative teams from MARVEL, DC and various indie publishers, signing autographs and doing panels on their projects, past, present and most interestingly future. The talent on hand was top notch, from DC's Scott Snyder and Greg Capullo of Batman fame to MARVEL's Kieron Gillen and C.B Cebulski of numerous titles that I won't even try to name here. The line up was spectacular. The quality of talent was not just limited to the international names however, as a ton of Irish talent littered the event. From Stephen Mooney to Declan Shalvey, the talent that the Irish brought was fantastic, but more of that in the second part. While I was at D.I.C.E, I got the opportunity to interview many of the creative teams at both MARVEL and DC. In each interview I asked how they were getting on, how were their Irish fans treating them and in the case of Scott Snyder and Greg Capullo, how much longer their run together would last. It was a weekend to remember and all of the guys and girls, Becky Cloonan was there and she was an absolute laugh, were on top form. Following are my interviews with some of the international talent which decided to come to Ireland and have the craic(don't worry it's a general Irish term for good times). I started the con off with Paul Cornell, a man of many talents, he has worked on Doctor Who, DC's Demon Knights title and is currently working on Wolverine in which he is penning the Killable arc where Wolverines whole perspective on life is changed when events lead to him losing his healing factor forever. When I caught up with him he was gracious and willing with his time and told me all kinds of things that will be coming up in the future regarding our favourite Canadian. I congratulated him on the birth of his son and asked how it went with deciding on his name, there had been a lively debate on what he should call his son on twitter, every name under the sun was suggested from all the various comics Paul has worked on over the years, in the end he went with Tom, which I think is lovely. When asked whether he'd be watching the 50th anniversary Doctor Who episode he said definitely and the explained how he was there at the 20th and it was wonderful to be around for the 50th anniversary. Becky Cloonan was an absolute treat, she gave me such wonderful and interesting stories about how she came to be the first woman to ever work on the main Batman series. She explained how she didn't know at the time that she was the first woman and how it probably helped since she already felt the pressure going into the Batman series after Greg Capullo was taking a break for an issue. She went on about how she has a soft spot for Harper Row and how she came up with some of the characters quirks, there was even a moment at the end where Becky and I mused about the possibility that Jokers "Daughter" could be Harper as we haven't seen her face and she has a similar look. We quickly laughed off the idea but I think both of us were still worried at the end. Becky did a panel with Scott and Greg all about their work on the Batman series and because there was such a demand they even did a second one directly afterwards, which in my eyes is pure class. There was then Kieron Gillen who gave an incredibly in-depth interview about what he and his creative team are doing with the Secret Origin of Tony Stark, an unusual take on an event in a characters life which we all take for granted at this stage in our reading of comics. He then discussed with me on his run with the Young Avengers and finally we both talked at length on how he was part of the team which turned Scott Summers aka Cyclops into the most hated yet most interesting character in the Marvel universe right now. Kieron was a true force unto himself, explaining in such great detail how he dealt with all these various characters over the years, he went on to compare Scott's journey into madness as an almost Walter White excursion, with him going through such layers of chaos and destruction. When I went over to Scott Snyder and Greg Capullo I'm not going to lie, I was intimidated. These two men made Batman interesting for me again. These two had created a narrative that was both beautifully written and visually stunning, I was in awe. Lucky for me Scott and Greg are two of the nicest guys you could ever meet. Between wonderful anecdotes of how Greg had been finding Ireland to Scott and Greg's adorable bromance, I was having so much fun. Scott and Greg went into how they feel the Zero Year arc is going and how they appreciate the fandom. When I asked Greg about the visual side of Zero Year in regard to that fantastic Riddler game splash page, he explained how Scott had wanted a crossword puzzle but Greg thought it wasn't enough so Scott found an ancient Egyptian board-game which actually fitted the mood they were going for. Scott divulged that during the next part of Zero Year we would be seeing the origin of many of Batman's rogue's, the next one being Poison Ivy. I then asked Scott a little on his run on Superman: Unchained, particularly on the identity of the uber powerful being running around, he said that all would be revealed in issue five because issue four is going to be all about the fighting. Well that concludes the first part of my journey into D.I.C.E, head over to the second part linked below to see how I got on with the Irish talent, who are it's safe to say, a great bunch of lads. As always comment below and let me know your experience at various comic conventions around the world. Here's a link to the article at Agent of Geek, which includes the audio for the interviews as well. Enjoy. For more info on D.I.C.E. visit the official Facebook page. Agents of Geek Interviews with audio.